The US shouldn't treat the Philippines like a “dog with a leash,” says President Rodrigo Duterte, adding that he does not want to see foreign soldiers in his country. The remarks are the latest in a string of inflammatory statements aimed at Washington. 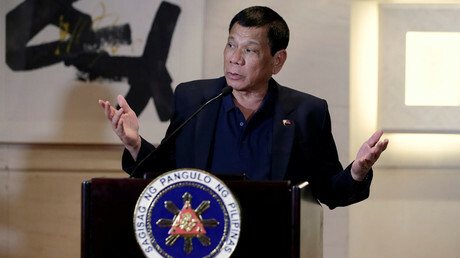 Speaking at a press briefing on Tuesday, Duterte said he looks forward to a time when he no longer sees “any military groups or soldier in my country, except the Filipino soldier,” GMA News reported. “I really hate it. I don't want it. We don't need it. There's not going to be any war in the future,” Duterte added referring to the presence of foreign troops. He said Washington could “forget” about an Enhanced Defense Cooperation Agreement (EDCA) with Manila if he is to stay in power. “...We have the EDCA. Well, forget it. If I stay here long enough, one day that EDCA will, if it's an executive agreement then I will just…" he said leaving his sentence hanging in the air. The EDCA provides for increased rotational presence of American troops in the Philippines. It also covers the use of Philippines military bases by US forces. The comments are the latest in series of confusing statements by Duterte when it comes to Manila's relationship with Washington. Last week, the Philippines leader announced it was “time to say goodbye” to its relationship with the US, including in the military and economic spheres. The US embassy in the Philippines referred to Duterte's remarks as “troubling rhetoric” at the time, saying they caused “unnecessary certainty.” It went on to state that it expected Manila to jointly honor alliance commitments and treaty obligations with Washington. However, Philippines Trade Minister Ramon Lopez told CNN on Friday that the leader “did not talk about separation with the US,” and that the US would not be stopping trade or investment with America. One day later, Duterte himself backtracked on claims that he was severing ties with the US. Earlier this month, Duterte also vowed to end joint patrols with the US in the South China Sea, citing a necessity to avoid actions which China could deem hostile. He also reiterated his vow to chart independent foreign policy without breaking existing treaties. In September, Duterte called US President Barack Obama a “son of a whore” after hearing news that the leader was to address his controversial “war on drugs.” The insult, which Duterte later said was not directed towards Obama, led to the White House canceling scheduled talks between the two leaders. However, a senior US diplomat said on Monday that Washington supports the Philippines government's “effort against the scourge of drugs,” but the US is still concerned over the number of deaths that have resulted as part of the effort. The campaign has prompted criticism from the US, despite 65 years of close partnership between the two countries. The European Union and the UN have also condemned the war on drugs. However, Duterte – who came into office in May on a promise to wipe out drugs and dealers – remains steadfast in efforts, vowing to continue the campaign until the end of his term. He has shrugged off accusations that he has violated human rights.